Discussion in 'Guitar Emporium Archive' started by averde, Apr 17, 2016. Collector alert! These don't come up very often especially in this condition. The guitar is an absolutely stunning VOS original Custom Shop Black Beauty, the discontinued version with an EBONY fretboard (not the Richlite stuff they're using on new Customs these days), 3 powerful Gibson BurstBucker Pickups and a Bigsby. Everything is factory original with the exception of the added bonus of a pro upgraded Tom Bartlett Nylon nut and the wiring which is currently set at 3 volume knobs and 1 master tone. Another rare feature is the incredible weight at only 9.5 lbs which is extremely rare for these as they're usually in excess of 10-11 on the scale. No issues to speak of whatsoever. It's in like new condition, super clean and I can't find a single imperfection. No breaks ever, no repairs ever, smoke exposure free and babied for life, never gigged and all electronics are in 100% perfect working order. The guitar sounds HUGE. Super resonant with big tight lows, great upper mid honk and really sweet highs. 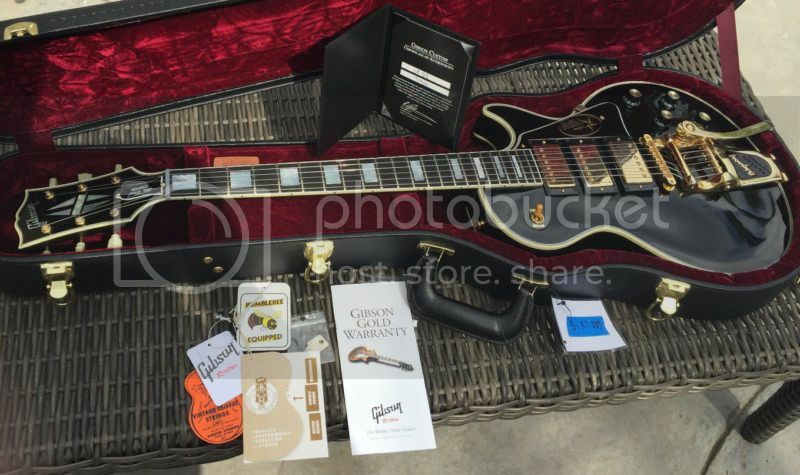 Includes the Original Gibson Custom Shop Hard Shell case, Certificate of Authenticity and all case items. Asking $4550 shipped. If using standard PayPal, we'll need to split the fees. The guitar will ship professionally packed and fully insured. reddgeetarzan, nolenuttt, Matt L and 1 other person like this.